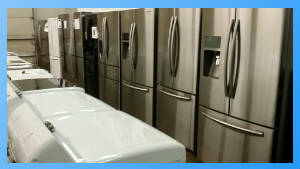 For used appliances in St. Charles, our 3rd Street location can't be beat. Get new, used, or refurbished refrigerators, washers, and dryers at 20-50% off regular retail prices and find scratch and dent outlet items on sale. The showroom is in the Frenchtown section of St. Charles. It is a discount retailer of dishwashers, freezers, microwaves, refrigerators, scratch and dent appliances, stoves, washers and dryers. The inventory is constantly changing, so if you don't see what you need online please call or come in. The St. Charles Appliance store is known for great deals. Whether you are looking for something for the kitchen or laundry room, we have the right item. For our Midrivers area customers, we often have products at our store that are return or display models. These models offer customers substantial discounts on items that have been discontinued, blemished or returned. If you are remodeling or selling your home, our low-cost appliances can help you update your home for less. According a report on the value of home improvements on the real estate web site Zillow.com, kitchen home improvements can provide the highest return on your investment. When selling a home, the cost of a minor upgrade like changing out the appliances can be recouped at 98% of the investment. The Zillow is assuming readers are buying these appliances at regular retail. Upgrading your appliances at our outlet appliance prices could increase your home price by more than the cost of the appliances. We understand the challenges rental property owners and property managers face on a day-to-day basis. This is why we provide products and services to simplify your lives. We work with home owners, real estate professionals and property managers to help them furnish or upgrade their properties with reliable and attractive appliances. We offer major appliance brands at a steep discount. With our appliance deals you can manage your out-of-pocket expenses and still delight your tenants with kitchen options such as Stainless Steel, French Door Refrigerators, Gas Stoves or Electric Stoves and ENERGY STAR products. We also provide professional appliance repair services with a staff of experienced appliance repair professionals available to service your properties. For those in the real estate business, having reliable appliance business to refer or do business with can be invaluable. Having access to premium appliances at a discount rate can help you close a deal, or assure your client that you are well established, and know who to go to for appliance purchase and repair. The next time an offer stipulates a replacement refrigerator or new kitchen appliances or an allowance for new kitchen appliances, help keep the sale on track by providing options for fast and inexpensive appliance replacement. If you have a client motivated to sell quickly but the kitchen has a 70's style kitchen, think about staging the kitchen with updated appliances. New appliances can help homes sell faster. Our outlet prices allow you to get the best appliances for the lowest price. When you think of cheap appliances, you might think of the door-buster sales at the big box appliance stores that offer entry-level appliances at low costs. 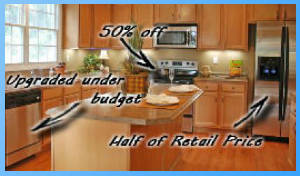 At St. Louis Appliance Outlet in St. Charles, our cheap appliances are premium appliances. at low prices. Shop online, call or if you are in the Midrivers area, come in to our store and see what we have to offer. 2231 N. 3rd Street, St. Charles, MO.